Since early 2008, many economists, bankers, real estate experts, and journalists, have weighed in on our local real estate economy and made bold predictions of its future. Most of these individuals made predictions that were completely inaccurate. One person made predictions that proved to be correct each and every time. That individual was me. Let me take you through them all. 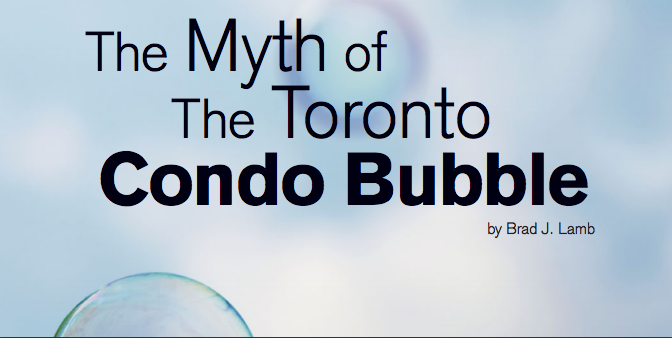 My latest publication “The Myth of the Toronto Condo Bubble” (http://bit.ly/W5DiW6) was published at the centre of the bubble storm in December 2012. I systematically broke down why this idea of a bubble existing and bursting was a ludicrous fantasy. I also predicted that the spring of 2013 market would likely be strong due to continuing low-interest rates, positive economic growth, and the short-term negative effect of Flaherty’s CMHC’s financing changes. I believed they would restrict buyers for 9 months or so. Additionally, I addressed that with Canada and the United States in an economic recovery it was not in the cards to see any substantial drop in Toronto pricing. I recently predicted that Toronto average prices will rise by 3-4% over 2013. I also stated that low-rise single-family homes will continue to rise in price and that there will be many situations of multiple offers. There are simply not enough of these 416 Toronto neighbourhoods for all of those that want to live in them. This hyper demand will continue to overflow into the condo market and while condo demand will not be as strong as the low rise single home demand, it still will remain strong in this environment. I predicted low price growth for condos over 2013 and new condo sales over the year at 14,000 units. It looks like these latest projections are proving to be right. With both the CIBC and TD coming out lately with strong projections for Toronto’s spring realty market and a clear statement that it appears Flaherty’s CMHC moves just stalled the market for 3 quarters. Consumers are not buying the bubble fairy tale, after 2 years of its spin, nothing has happened except continuing low-interest rates and positive economic growth. Neither of which will enable a real estate collapse, rather further price growth. The question to ask is how long will the low-interest rates and slow growth environment continue. It is extremely unlikely that in this interest rate environment that buyer interest will wane for real estate. Given that the major western government policy is to rein in public spending, deficits, and debt, is it impossible to see an environment when governments will pursue a higher interest rate policy? With government policy in place to reduce spending, it is also hard to see substantive economic growth for years (3%+). It is for this reason that I predict that Canada’s central bank rate will stay below 2% for at least 5 years and economic growth is unlikely to break 3% per year over that period. Over the next 5 years, I predict Toronto real estate prices to average 3-5% price growth per year. I also predict that condo prices will rise little in 2013, but starting in 2014, we will start to see a return to 1-3% increase in Toronto condo price growth. The need for Canadians to earn real returns on their investments will make investing in condos for the long term a continuing trend. The lack of viable safe havens for wealthy individuals in China, Africa, the Middle East, and south-east Asia will also continue the flow of capital into the Toronto condo industry. The proof is in the pudding. You can continue to make bold predictions of disaster, but without results, what value are your predictions? Making the same _____________ prediction will one day make you right. Once.